The Remington MS2-390 is an affordable electric shaver that has been around for a long time, being a very popular choice for anyone looking for a basic shaver that gets the job done without any fuss. But as you’ll find out from our review, there are some drawbacks to the MS2-390 that can be a deal breaker for some users. Wrap-up—Who should buy the MS2-390? Being an electric shaver that uses a foil system, the MS2-390 has two titanium micro screens that feature Remington’s so-called ComforTech contour technology for comfortable and efficient shaving. The pop-up trimmer has a titanium coated blade and it’s wider than on most shavers. It slides out with a nicely dampened motion, so it doesn’t really “pop-out”. It’s a nice touch by Remington, definitely something you’d expect to find on more expensive products. the fully extended position (right button), used for trimming the sideburns and moustache. Unfortunately, being that bulky means that the trimmer won’t be very practical for any real grooming and touchups. It will slice through the stray whiskers without any problems though. If you’re looking for an electric shaver with a very capable trimmer, then this isn’t the one for you. There are better alternatives from Braun or Panasonic. 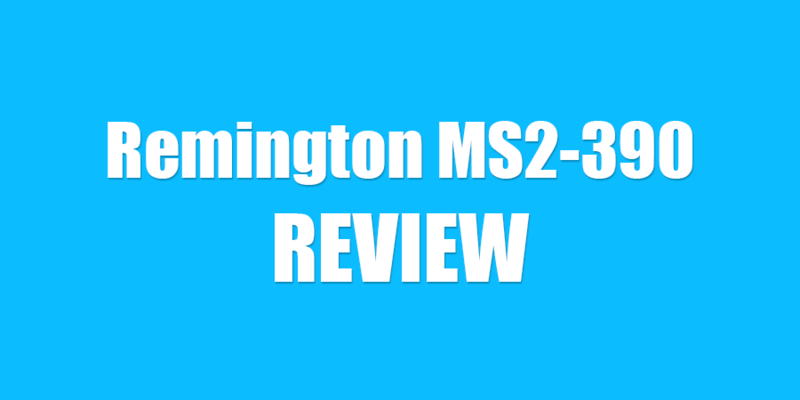 In terms of build quality, Remington MS2-390 is a mixed bag. On one hand, the body seems very robust and well put together. The rubbery surface provides an excellent grip even when it’s wet. 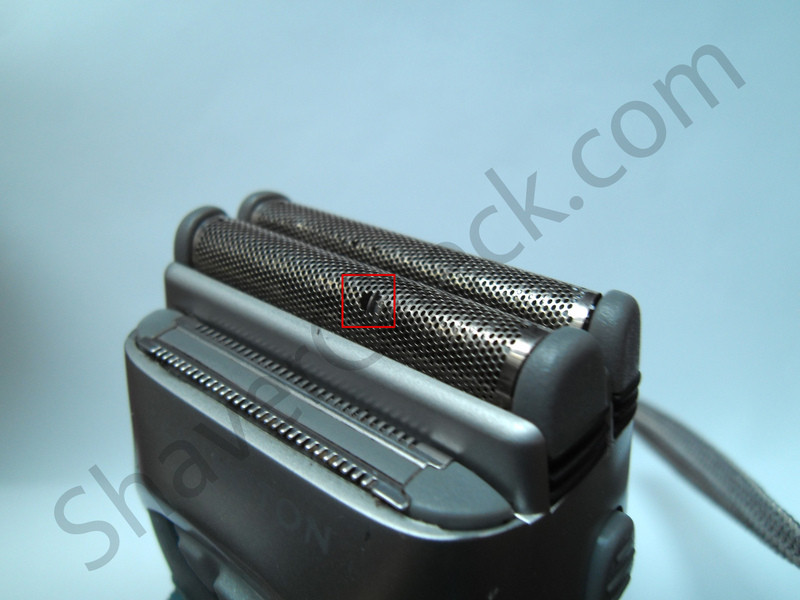 On the negative side of things, there is the actual shape of the shaver. Although it is not by any means uncomfortable, holding it just doesn’t feel as good as other shavers due to its flattened and very wide profile. The ON/OFF switch has a rubber cover that will wear out and break after extended use, as it was the case with my other Remington MS2-290, which is the same model without the Quick Charge option and the low charge indicator. Finally, there’s the cutter assembly which is a bit flimsy and doesn’t feel as sturdy as the rest of shaver. The side buttons for releasing it are also too sensitive — you can touch them by accident when handling the shaver and the cutter will just pop-out. Being a corded/cordless rechargeable shaver means that Remington MS2-390 can be used with or without the cord. You should keep in mind though that frequent corded use can reduce battery life. Another benefit is that you can’t overcharge it and damage the battery, so you can leave it plugged in between shaves. The automatic dual voltage conversion makes this shaver compatible with voltages worldwide (110-240V). Battery life is actually pretty good; a single charge should provide enough power for up to one hour of shaving. Quick charge is a handy and welcome feature that gives you enough power for a single shave from just five minutes of charging. Like the corded use, you shouldn’t do it on a regular basis as in time it will affect battery life. a charging indicator that glows green while charging and blinks when fully charged. Cleaning the MS2-390 is quick and easy, just remove the screens, brush the cutting blades and trimmer with the included brush and rinse with water. For the foil, you just blow the debris and can also rinse it with warm water. This “ritual” should be performed after every use to maintain it in optimal shape. For a simple electric shaver, without fancy features and technologies, the Remington MS2-390 provides a surprisingly close shave. While it won’t be the most comfortable shaving experience, the majority will be pretty satisfied with its performance. Difficult patches of hair may require multiple passes, especially on the neck and jawline. A potential problem is with the cutting blades and the protective screens which tend to wear out pretty fast and need to be replaced more frequently. I also experienced this with my personal shaver, as the cutters have worn through the screens (see the picture below). This happened after more than a year of regular use. Remington says that the screens should last 6 months and the cutters 12 months, depending on how often you shave. However, given Remington’s not so great track record with regards to reliability, especially during the last few years, I wouldn’t be too confident in recommending the MS2-390. This shaver comes with a charging brick, cleaning brush, protective head guard and a rather posh travel case. Not too bad, I’d say. The Remington MS2-390 is a low price, simple and effective shaver, without the bells and whistles of more premium-priced shavers. I would recommend it as a first shaver for a young man or for anyone who doesn’t have unrealistic expectations from an affordable and basic shaver. However, if you’re willing to raise your budget a little bit, you can go for something like a Panasonic ES8103S, which is a better shaver in every way. Another aspect you should consider is the noise. This thing is loud. For some, this may not be a problem, but if you’re worried about waking up the children or your significant other, this shaver isn’t for you. Finally, the MS2-390 is an old model that was discontinued for quite some time. An alternative would be the Remington F5-5800, a very popular shaver, especially among die-hard Remington users. This one was also discontinued, but it is still widely available. Great post. I was checking continuously this blog and I’m impressed! Very helpful info specially the last part 🙂 I care for such information a lot. I was seeking this certain info for a very long time. Thank you and good luck. Thanks a lot for your kind comment. I’m glad you found the information useful. There will be more reviews and articles in the near future. My MS2 390 does not hold a charge very well. I let it charge all night, and when I’m about half through shaving the red light goes on and it starts slowing down. Usually when a shaver doesn’t hold a charge for at least one shaving session it’s time to get a new one. You can go around this by using your MS2 390 plugged in. I definitely recommend doing that because when the razor starts slowing down half way through, the motor fails to operate at full capacity and the cutting blades oscillate at a slower speed. This is a typical scenario that will often cause some serious pulling and tugging and your overall shaving experience will suffer. The switch broke on mine, and can’t find anyplace to buy a new one. Is it discontinued? yes, the MS2-390 was discontinued some time ago. Of all my Remingtons (XLRs, DA-series, and the MS2-280, the MS2 definitely has the most fragile foils. I rotate all my shavers and they get equal use, but for some reason, the MS2s, like you indicated, wear pretty fast. I suspect it is not the foil, but the cutter. Unlike the cutters in the DA and XLR series Remingtons, the MS2 cutters are rounded and have a higher curve, hitting the foil more directly, I believe, than the others; yet, the other provide at least a good a shave as the MS2s. I also have a plug-in only MS2-100…it is new but they haven’t made it for years. I believe it will suffer the same foil fate as the other shavers in the MS2 series. Thanks for your very helpful site.